To share in Facebook, please look up and add friend Stu V. StuvWx. You can also get notices of new posts in email by clicking the “Follow” button at the lower right–hand corner of this blog. Thank you. Maps that are already UPDATED are indicated on their links. For maps still awaiting an update, please come back regularly to check on maps you are concerned about. Or click the “Follow” button on the lower right so you will be notified through e-mail when posts are made. NOTE: The updating of earthquake maps proceeds at random…. MMEIRS Scenario 8: Magnitude 7.2 Earthquake along the West Valley Fault System by JANE T. PUNONGBAYAN, Ph.D.
“The Triangle of Life” NOT true …an urban legend? WHAT IF ANGAT DAM COLLAPSES? In the Line of Fire. WHAT IF ANGAT DAM COLLAPSES? …water seeks its own level. ANTIPOLO: HIDDEN IN PLAIN SIGHT (they’re showing but not telling) part 1. ANTIPOLO: HIDDEN IN PLAIN SIGHT (they’re showing but not telling) part 2. What about Bonifacio Global City? If you know them, tell them …maybe in the future, that will one day save people. At close inspection, the 2015 fault trace generated from Phivolcs’ Valley Fault System (VFS) Atlas deviates from the 2010 fault trace at most minute points. This means structures thought to be sitting atop a fault line may not be sitting there at all, and those next to or thought lucky to be spared from being on a fault line may turn out to be lying on the fault surprisingly. With the 2015 fault trace, it would seem that new fault lines appear while some of the old ones disappear –drastically changing lives. Yet the simple explanation is, plotted points shift thus making the faults move several meters away from their previous locations. 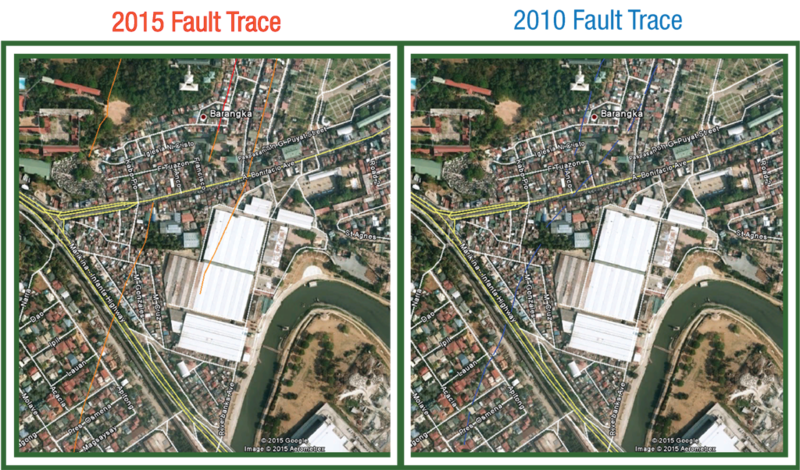 Because the difference between the old and new fault traces are very significant, and that the 2015 fault trace has superceded the 2010 fault trace in use, this is seen as a precedent wherein an official fault trace can still be replaced by a newer fault trace, bringing with it the problems associated with a rogue, “wandering” fault line. While this casts doubt on the finality of the 2015 fault trace, meaning in the future there may be an update that shows a different, divergent fault trace that again changes the ball game, people are also realizing that plotting and pinpointing fault traces is not an exact science and to a certain extent, it is informed guesswork. On the macro level, the accuracy of fault traces are still better than good –to the credit of the laudable men and women of Phivolcs who try hard to give the public credible information; it is on the micro level, however, where accuracy matters that spell the difference between life and death, but where today’s technology is sadly lacking. In light of this reality, people who are affected, or potentially affected, by either the 2015 fault trace or the 2010 fault trace should familiarize themselves with the information provided by the other fault trace to get a holistic assessment of their situation before deciding based on what their intellect or gut feel tells them. This entry was posted in Earthquake, Natural Disaster and tagged cavite, disaster, earthquake, east valley fault, epicenter, EXPOSING the Marikina Valley Faultline System, faultlines, large earthquake, list of subdivisions, magnitude, marikina, megaquakes, montalban, muntinlupa, Natural Disaster, pasig, payatas, philippines, phivolcs, quezon city, safety, san pedro, taguig, tulisanes, west valley fault. Bookmark the permalink. Do you have interactive map? No, i am old school. 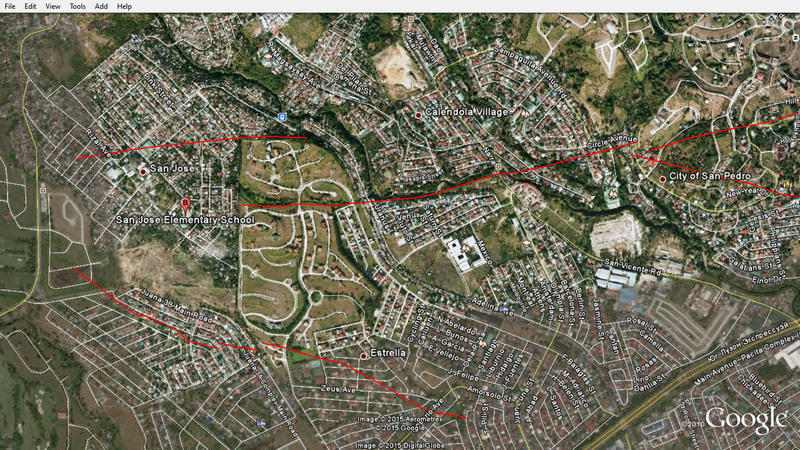 Did antipolo in phase ll peace village is dengerous of fault line? yun po terra verde residence sa Bancal Carmona Cavite (Bagong tayo po na village), Nasa earthquake fault line po ba siya? Delikado po ba dun sa lugar n yun kung sakali mag lindol? Sir, affected po ba ang Greenwood Village sa Dasmarinas? hi i am really worried now when i read this,about the place where i get a unit in METRO MANILA HILLS community in Montalban,as i have read the list of affected areas it stated some of the places in Montalban i dont really know exactly where is it but im really worried if its like near to Metro Manila Hills community it was just in front of Erap community in montalban,i actually ask my agent about it & she just said that it was approved by phivolcs so nothing to worry about landslides,i wanna make sure if its true or not..please give me some infos regarding this. Trying to get yung exact layo namin from the San Jose GMA Cavite fault line.Pwede po bang malaman yung exactong layo naminsa fault line ang house po namin ays a harap ng San Jose Elemntary School , San Jose GMA Cavite. Kindly give us the exact street on conception uno manikinA. So we Can discuss to Our community. so sorry to reply just now. you will understand after reading my latest post above (on this page). thank you for your patience! Hi! I live in Bangkal, Makati. My zip code is 1233. Will this area be affected? If yes, how strong or at what costs basing from the nearness to the fault line? Hi Sir. Would like to ask if Maria Montessori in Orkidia Pembo is included in the fault line? If we live in McKinley hill at megaworld the Venice residences, are we affected by the faslt line? God have mercy on us! I am living Kilometers away from the fault line but i am scared. Only prayer can touch the heart of God. I want to ask if magiging heavily affected ang Sampaloc sa manila? how.about our area sitio sto niño san martin de porres parañaque city? We are near at south daang hari taguig. Thanks! Can u tell me what is the exact street in industrial valley in marikina is in danger so that we can talk to them personally and give some advice. Thank you. I really appreciate your response. please see my reply in the post “Where on Earth? (for selected requests only).” thanks! Hi! Worried kid here.Would be Tayuman/Bambang area be gravely affected? what about bacoor, cavite. we are from cavite but we are a stone throw way from las pinas. Damay po ba ang paang bundok sa quezon city? Yung malapit po sa north cementery. Tska po sa laguna yung pacita po? How about sm blue residence nasa fault line din ba sya? I live in Provident Village and I’m planning to have my house extended, adding a two story house with a roof deck. Please give some advise. Thanks. i think the problem provident village will have is liquifaction. you may be finding your house sinking in deep mud. Hi, we leave in Spring Valley Subdivision (far end of Filinvest 2). Do you think it’s outside the buffer zone?? Hello! Tatamaan ba an Parang Marikina city meteor homes? Good day! I would like to ask if malolos bulacan is affected in the fault line? Thank you very much! however, if your area is not anywhere near the places in the maps, it could be malayo kayo sa fault line. but most importantly, mas mahalaga na MATIBAY ang tinutuluyan niyo. ikonsulta nyo po ito sa isang licensed architect o structural o civil engineer. thank you for your patience! Does the Marikina Valley Fault, covers the town of Angat, Bulacan, If so, what baranggays are included or, where could I see a map of it. would like to ask kung kasama po ba project 4 kasi we are residing at Barangay Escopa 3 Project 4 Quezon City. Pati po Cubao. no. pero kapag mahinang istraktura ang tinitirhan niyo, may posibilidad na babagsakan kayo nito (pasensiya na po if i was brutally frank). Hi tulisanes.. I live in San José, San Miguel bulacan would you mind give an information if we are standing on the fault line.. Thank you.. And also San Juan, Batangas for my mother.. God bless.. Standing on the fault line also in San Juan Batangas for my mother? Thank you! Sir/ma’am I really need to know if sa Pidam Homes Ampid, San Mateo, Rizal po ba ay nakatayo sa mismong faultline???? I really need po ng answer nyo, nag pa panic na po kasi tita ko. Salamat po. just wanna know our distance in marilao grand villas loma de gato, marilao bulacan to the fault line?..thank you in advance for the info..
Hello, I live in BF Homes, Paranaque and I’d like to ask if that place is affected? Oh yes, I do too. Can we both have details? the ground will shake everywhere in the metro. though it may not rip underneath you, the roof over your head or the walls may collapse. the general rule is: if the structure above your head is very old or was not designed by a licensed architect and licensed structural or civil engineer, then you are nonetheless VERY MUCH affected as the structural integrity of the house or building may be weak, and the roof and walls can collapse. Aw, dang. I live there too. What would you suggest? Same here. I’m worried and want to know what to do. you have the zip code? really, it will be much easier (for me) if you check the Links and Maps here. thank you. okay, okay. filmore st. is about 6.25 kms. from the faultline. but you will still be affected by the shaking. the general rule is: if the structure above your head is very old or was not designed by a licensed architect and licensed structural or civil engineer, then you are nonetheless VERY MUCH affected as the structural integrity of the house or building may be weak, and the roof and walls can collapse. no, no fault line there. however, i suggest you worry if your house is structurally strong and stable instead. We are living in Malabon area , is there any chance of us being severely affected ? Is there also any chance to have a tsunami just like what happened in Japan . in the general vicinity of san jose del monte, it is about 10.39 kms away from a fault line. however, even it is far, even if it is far, the general rule is: if the structure above your head is very old or was not designed by a licensed architect and licensed structural or civil engineer, then you are nonetheless VERY MUCH affected as the structural integrity of the house or building may be weak, and the roof and walls can collapse. I’m being paranoid, I’m living at Comembo near pembo and east rembo.How bad will it be? only God knows. but if we focus on what we can do rather not do, the general rule is: if the structure above your head is very old or was not designed by a licensed architect and licensed structural or civil engineer, then you are nonetheless VERY MUCH affected as the structural integrity of the house or building may be weak, and the roof and walls can collapse. How about in Tayuman Manila? Thank you very much miss. tayuman? ang layo nito. PERO kung mahina ang tinitirhan niyo o ang mga katabing gusali nito, may posibilidad na may pagguho na mangyari at mabagsakan kayo (sorry to be brutally frank). kumunsulta po sa LISENSYADONG arkitekto o structural/civil engineer. Forgive my ignorance but is Sucat part of Muntinlupa? I have a condo unit directly opposite SM Sucat – Avida Towers. Thanks for your understanding. God bless you. Good afternoon. Thank you very much for the information. My mother and my other siblings with their respective families live in Pamayanan ng Tagumpay, Brgy. San Jose, Rodriguez, Rizal, which is directly situated at the fault line. I will convince them to relocate to where I am currently residing; yuan st. united north fairview sudb., phase 8. could you possibly assess if my location is far enough from the fault line? this will be such a relief. Again, thank you thank you very much and may you be blessed for spreading awareness about something as inevitable as the earthquake. fairview chapel is about 4.44 kms. from the “latest” fault line. Pls kindly check if acacia estates is near the fault line area here in taguig city. We are near in c5 road. Can you give us estimate in km.? Thank God I came across this site! Nakakatakot but knowing is half the battle sabi nga. So I just had to look through your maps and read even the old articles that are very informational. Our house is in Dao Street, Northview 2 Subdivision, Batasan Hills. Now I don’t know if we should move out and find another place to stay. 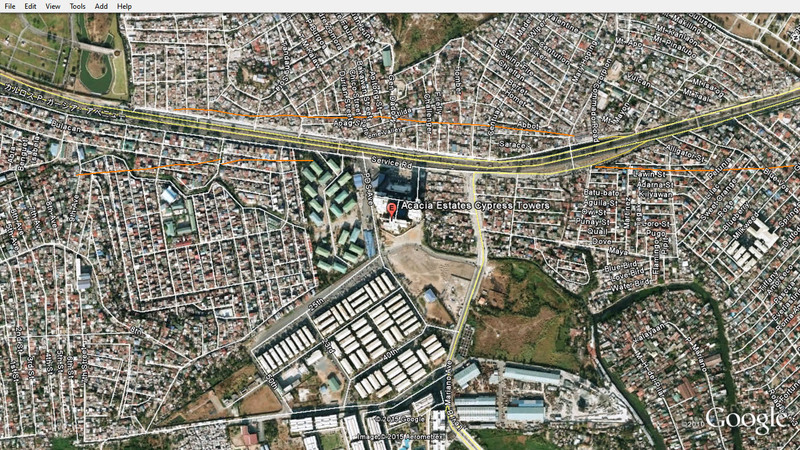 It doesn’t look like it’s on top of the fault line based on your map but its quite close (my estimate is around 100m) from the nearest one which crosses the Batasan-SanMateo Road and passes along Gold/Copper Street. Can I ask po, if you have the info, what is the margin of error ng location ng fault lines sa map? Baka kasi it’s actually closer to our house than what it looks like from the map. I read about the 5m clearance but I agree with you in one of your older posts (I hope I got it correctly) that this is not enough. Salamat po for all your efforts in putting all these info together in your website. God bless us all! so what about Nagpayong Pinagbuhatan Pasig City? pls. check the maps first. Hi.. Thanks po for the very useful data you’ve shared.. Would like to ask for list of barangays in pasig city that will be affected or lying directly on the fault line.. We are living in brgy sta lucia and I also have friends and relatives in some areas of pasig city.. Tnx in advance for your favorable response..
you can ask phivolcs for such list. Good day! Kudos to your valiant efforts in posting this blog and responding to queries. Would like to inquire if our apartment is on top of a fault line or near one? How near if so? My location is 57 Baluarte Bldg, Banaag St. Bgy Pineda, Pasig City. Would also like to inquire on behalf of my family as well as my fiancee’s. They reside in Phase 6 Hybrid St. Greenwood Exec. Village, Cainta Rizal, and Sto Cristo St. Angat, Bulacan. Also, do you know the basics on checking if a house is stable? There are hairline ceacks which I understand are not a grave threat but an expected occurence. Other info would be appreciated. Thanks, Godbless and Godspeed to us all. the fault crosses at the back of nearby universal robina and actually hit the back of it. greenwood exec. is 3.8 km away from the nearest fault, and angat bulacan is simply just out of the way. i suggest you contact a licensed architect, or a structural or civil engineer to give you their expert opinion. that’s hard work you make me do. either i get paid to do the job or you just check out my maps –free. it’s all there. every long and short crack of the west and east valley faults are all accounted for. a little research helps. Hi! I was led to your blog as I was looking up fault lines.. I checked your maps and I can’t find our area in Laguna. I can’t toggle/move the map either.. Is it safe to say that we are “considerably” far from the fault line? Our place is located in Elvinda Village 3 blocks from National Road (4th St./Amarillo St.). I’m just quite worried because the ground below us seems to be receding and the walls have small cracks on them that wasn’t there around 2-3years ago.. I thought the soil recession was due to the floodings but I still am worried. May I have your opinion about this? Thanks! Our house is located at Purok 2 Sucat Muntinlupa. Near Sucat PNR station. Are we on the fault line. Thanks. ask ko lang po kung yng Pinagsama Village C-5 Taguig ay malapit sa fault line.Many thanks. And God Bless us all. the maps are there to guide you. however, i can say YES then you’ll come finding out for yourself with your unbelieving eyes. but i’ll say NO and you won’t know that i may be lying. again, the maps are there to guide you. a bit of RESEARCH won’t hurt. From the map screenshot cupang, buli, sucat from the right side our house is located but 2 blocks away and i couldn’t see it from the map. Is there any map from Sucat to Bagumbayan Taguig. Im worried because our house has lots of cracks from walls. Im not sure if its the effect of PNR railway every now and then the train passes our place. Many thanks. 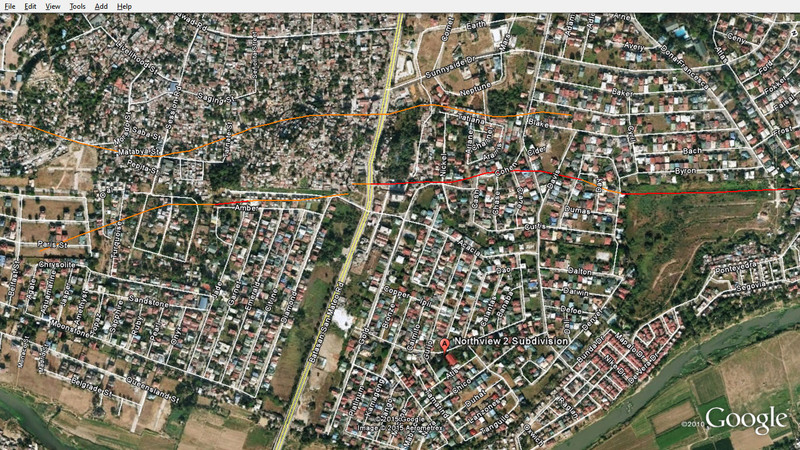 Hi i live in marikina what brgy in marikina po ang fault line na tatamaan. ?, thanks po. Thank you for the very informative site. It must’ve been very tedious to do this research and kudos to your patience and passion. Double check ko lang po, Sir, South of Market, BGC which lies on 11th Ave. cor. 26th St. Saw it highlighted on your MV Fault System, Philvocs. Is it really on the 26th? SoMa is a 39-floor high rise condo and we’re looking to invest on it as well as live in. Your response will be highly appreciated, thank you very much. Ask ko lang po kasi malapit kami sa Filinvest Homes 2. Kung malakas din ba impact sa amin. Sa may Bgay Holy Spirit, Quezon City infront of Commission on Audit along Commonwealth Ave. Thank you. malakas man o mahina ang impact, depende po lahat talaga sa tibay ng inyong bahay, na sana dinisenyo ng lisensyadong arkitekto o inhinyero. pati rin po sa kalidad ng materyales na ginamit sa pagpatayo ng tirahan ninyo, na huwag naman po sana “undersized” at tinipid sa sangkap o sa mga tamang materyales na ginamit. kumuha po kayo ng arkitekto o inhinyero para suriin ang tirahan ninyo at siya na rin po ang magbibigay ng rekomendasyon sa dapat ninyong gawin. ‘ingat po! Sir, how about Colinas Verdes in San Jose del monte, Bulacan? Is it safe to buy a property in that subdivision? Thank you so much. colinas verdes is about 5.6 kilometers from the nearest section of the faultline. it’s not really so much of the distance, or how far or near the property is. just make sure the house or structure on it is designed by a licensed architect or engineer. Cabuyao Laguna ba my faultline din b dto? If meron ano pong barangay ? Pls send me the details pra po mka pag prepare po kami….thanks po…. cabuyao, laguna would be about 8 to 10 kilometers from the nearest section of the west valley fault. Do you think could overlay the liquefaction map on philvolcs website onto a google map? I met this family from New Zealand and they showed me pictures/videos of Christchurch, a main city, sinking two meters because of this. Thanks for your website by the way. wanting to get a unit from victoria towers timog…is it safe? thanks? Hi, I live in 16 President Osmena Street, South Signal Village,Taguig City would you mind give an information if I am standing on the FAULT LINE? Thank You…. south signal village is luckily out of the way. residents of north and central signal villages are the ones to be real careful of the west valley fault which lies hidden underneath. Sir how about cielito homes taytay Rizal it is along ortigas ave ext, and dagat dagatan navotas city thank you. remember earthquakes don’t kill; collapsing structures do. rather than spending time and energy worrying about when the big one will happen, focus on the roof above your head and visually inspect how strong, or weak, you’re house is. structurally stable houses and buildings are usually constructed with the expertise and services of a licensed architect and civil or structural engineer. for starters, try to get in touch with one of these professionals and get their assessment of how safe you are in your house should an earthquake hit. select and open the maps you like, right-click with the mouse, then save to your computer. that simple.